Born in 1000 BCE, Kashiraj Divodas Dhanvantari is hailed as the Father of Surgery in Ayurveda, the oldest and the most holistic medical science in the world. It forms a part of the Atharva Veda, one of the four Vedas. Ayurveda means ‘science of longevity’, derived from the Sanskrit root ayus, meaning longevity and vid, meaning knowledge. Ayurveda originated from Brahma, the Creator. He created Ayurveda before creating man, as an upa-Veda – subsidiary of the Atharva Veda – in one thousand chapters containing 100,000 shlokas, He taught this to Daksh, who then revealed it to Ashwini Kumars, the celestial twins and physicians of the devas. They transmitted it to Indra, who revealed it to the risihis of Ayurveda. Three Important rishis of Ayurveda are: Dhanvantari, Sushrut and Charak. The name Dhanvantari first appears in the ancient Hindu shastras as the twelth avatar of Vishnu during the Samudra Manthan – churning of the ocean. Of the fourteen gems that sprung forth, one was Bhagwan Dhanvantari, who emerged with an urn of amrut the divine nectar which delivered its drinker from death, to attain immortality. He is also known as the original, Adi Dhanvantari, the celebrated physician of devas. The second, down to earth Dhanvantari, was Kashiraj Divodas Dhanvantari, the King of Kashi. 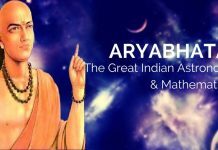 He was the first surgeon of Ayurveda. His teachings and surgical techniques were compiled by his foremost pupil, Sushrut, in the Sushrut Samhita which has survived over the ages. Samhita means compendium. Some of his teachings, too, were compiled in works, now lost, by his other pupils, namely Aupadhenava, Aurabhra, Bhoja, Galava, Gargya, Gopurarakshita, Kankayana, Nimi, Paushkalavata and Vaitarana. He is also the founder of the school of surgeons which came to be known as Dhanvantariyas. According to Dhanvantari, the fifth faculty, Salyantantra, was the oldest of all faculties of Ayurveda. Only after the formation of the school of surgery did the school of physicians emerge, heralded by Bhagwan Punarvasu Atreya. The latter recognized Dhanvantari as a high authority of surgery. A contemporary medical treatise, Agnivesh Samhita, also mentions that specialization in surgery had reached such a stage that general practitioners referred all cases needing surgical treatment to specialists in surgery. In this Samhita, Divodas Dhanvantari details the formation and development of the human embryo by Dhanvantari, which correlates with the vivid description given by Sushrut in his Samhita. Excisions (removal) Bhedya Bladder of a dead animal, puncturing a leather pouch filled with fluid. Extraction – Aharya Withdrawing seeds from the kernel of a bimbi (aegle marmelos), bilva (Cephalandra indica) or ljack fruit, teeth from jaws of a dead animal. 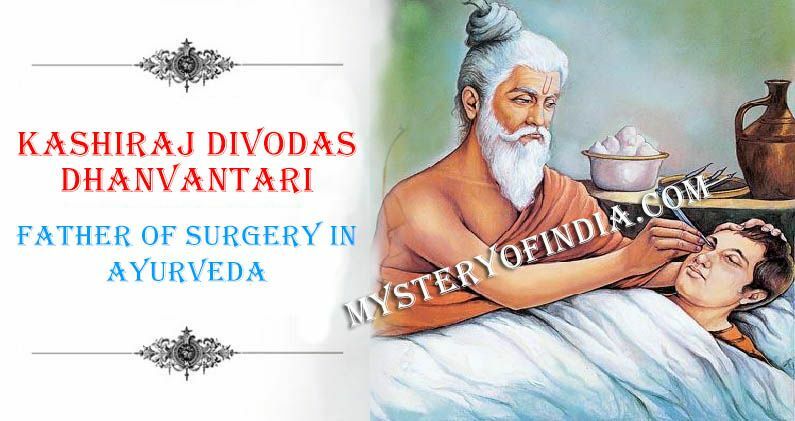 The advantage of such experimental practice, according to Divodas Dhanvantari, was that an intelligent physician would never lose his presence of mind in professional practice, Divoda’s methods, as compiled by Sushrut illustrates his emphasis and insistence on discipline and high standard of training expected from a student training in surgery. Some of the surgical procedures include lithotomy – removal of stones, skin grafting and rhinoplasty – repairing a mutilated nose. The latter two earned him the title “Father of Plastic Surgery.” However, recent scholars have conferred the title to his pupil Sushrut, probably because it was first penned in his Samhita, since Dhanvantari had no written treatise to his credit. Jurgeon Thorwald, in his book Science & Secrets of Early Medicine – Egypt, Mesopotamia, India, China, Mexico & Peru (1962), has observed that his method for rhinoplasty, which used a flap from the cheek was adopted and practiced by Gasparo Tagliacozzi, professor of surgery at Bolgona, in the sixteenth century, “There is scarcely any doubt that this method… which seemed to emerge out of nothing (in Europe), … had its roots in early India… Nowhere else in the whole world of antiquity do we find any precedent for that conception,” observes Thorwald. He added that in 1814, a newspaper account from India inspired Joseph Constantine Carpue, a pioneer of modern plastic surgery to restore a nose. This was the first attempt in Europe then. Carpue was greatly impressed by such successful operations performed by Indian village surgeons exactly as described thousands of years ago in the Sushrut Samhita. 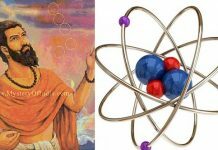 Dhanvantari also made contributions in the fields of physiology and anatomy, dravya vignan – pharmacology and material medica – and chikitsa vignam – therapeutics. One of his important contributions has led modern scholars to also call him a molecular biologist. He gave a complete theory of drug-composition, molecular structure, physio-chemical properties and therapeutic actions of food and drugs. 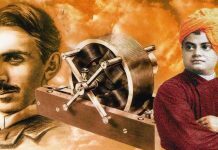 He based these concepts on the Nyaya system of paramanu (atoms) and anu (molecules). In physiology, he was the first in the world to cite the haemopoetic, or blood forming factor in yakrut – liver – known as ranjakpitta, and the role of both the liver spleen in the formation of blood. He was also the first to prescribe raw goat liver for treating anemia and naktandhya (night blindness). Acharya Vagbhatta, a later proponent of Ayurveda, in the fifth century CE, described a similar factor occurring in the stomach with identical functions. In 1926, Minot and Murphy showed that liver was the most effective ingredient in the treatment of anemia. Ricks in 1948, and Smith, a few years later, described an amorphous red-principle from proteolysed liver, to be effective in pernicious anemia in very small doses – now known as Vitamin B12. Vaghbhatt’s factor was re-discovered by Castle in 1929, in the stomach and was named Castle’s Intrinsic Factor. Many such original discoveries can be listed which originated in ancient India, attributable to Dhanvantari and his followers. The few examples discussed remind us that these stalwarts of Ayurveda practiced an astonishingly scientific, sophisticated and advanced art of medicine as early as the third and second millennium BCE. Several millennia later, so called “modern medicine” is retreading their beaten paths. The facts and photos are simply amazing.West will have to survive few thousand years to match any where near mistry of India.Feel proud to be an Indian. Well done. You have presented a true picture of Ayurveda before the world. Yes the Western World will never be able to reach anywhere near to Ayurveda till the end of humanity.